Our practice has a qualified Percolation & Water Table Test Operative on staff as these tests are now required to be submitted with all planning applications. The purpose of an EPA Site Suitability Assessment is to determine the suitability of the site for a wastewater treatment system. The assessment will also help to predict the wastewater flow through the subsoil and into the sub-surface materials. The site characterisation process outlined here is applicable to the development of a single house and more extensive site characterisation is required for cluster and large-scale developments. The key to installing a reliable on-site system that minimises the potential for pollution is to select and design a suitable treatment system following a thorough site assessment. For a subsoil to be effective as a medium for treating wastewater, it should retain the wastewater for a sufficient length of time, and it should be largely unsaturated and hence aerated. Only after a site assessment has been completed can an on-site system be chosen. 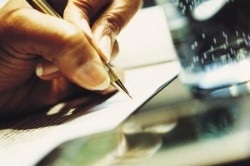 The information collected in the evaluation will be used to select the on-site system. Are there any site restrictions on the site? 3. Conclusion and Recommendation (selection and design of a wastewater treatment system). To assist in the selection of the on-site system and to standardise the assessment process, a site characterisation form should be completed. The completed form including photographs, site plans, cross sections and design details should accompany all planning applications for on-site wastewater treatment systems for single houses. Establish if there are site restrictions. A desk study involves the assessment of available data pertaining to the site and adjoining areas that may determine whether the site has any restrictions. Information collected from the desk study should include material related to the hydrological, hydrogeological and planning aspects of the site, which may be available. The density of existing housing and performance of the existing wastewater treatment systems may influence the system recommended and should be noted at this stage. Each site is specific and local factors and previous experience of the operation of wastewater treatment systems in the area should be taken into account in using this guideline information. The Groundwater Protection Schemes (GWPS) provide guidelines for developers in assessing groundwater vulnerability and for the planning authorities in carrying out their groundwater protection functions. It provides a framework to assist in decision making on the location, nature and control of developments and activities (including single house treatment systems) in order to protect groundwater. The density of onsite systems is also considered at this stage. The protection responses required to protect groundwater from on-site systems should be satisfied. Where no GWPS exists, interim measures, as set out in the Groundwater Protection Schemes should be adopted. If additional requirements are required then this should be noted in the comments section. Also, if there are existing or proposed wells in the area then the minimum distances set out in the Groundwater Protection Responses should be noted at this stage. 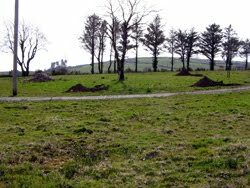 Presence of significant sites: Determine whether there are significant archaeological, natural heritage and/or historical features within the proposed site. Past experience: Is there evidence of satisfactory or unsatisfactory local experience with on-site treatment systems? Is there a very high density of existing wastewater treatment systems in the area? What are the background nitrate concentrations? Provide sufficient information (including photographic evidence) to enable a decision to be made on the suitability of the site for the treatment and discharge of wastewater and the location of the proposed system within the site. Landscape position reflects the location of the site in the landscape e.g. crest of hill, valley, and slope of hill. Sites which are on level, well drained areas, or on convex slopes are most desirable. Sites that are in depressions or on the bottom of slopes or on concave slopes are less desirable. It is more difficult to install pipe work and ensure that the wastewater will stay in the soil if the land has a steep slope. In some cases the pipes should be laid perpendicular to the slope. Where there is surface water run-off and interflow, low lying areas and flat areas generally receive more water. This accounts to some extent for the occurrence of poorly drained soils in low-lying areas. Soils with poor drainage, however, may also be found on good slopes where the parent material or the subsoil is of low permeability. Provision should be made for the interception of all surface run-offs and seepage, and its diversion away from the proposed percolation area. Mound filter systems are prohibited on sites where the natural slope is greater than 1:8 (12%). Minimum separation distances, as set out in the Epa Wastewater Manual should be maintained from specified features. The presence/location of surface features such as watercourses including ecologically sensitive receiving waters, site boundaries, roads, steep slopes, etc. should be noted. The performance of existing systems should be examined and the cause of problems identified and remediated. Potential impacts from adjacent wastewater treatment systems should also be considered. In addition, the implication of any potential impact due to the increased nutrient load on the groundwater quality in the area should be assessed. This is particularly true in areas of high-density housing and in areas where the background nitrate concentrations are already elevated. It is estimated that a 6PE wastewater treatment system (without specially designed nutrient removal) will increase the nitrate levels by 21mg/l NO3 per hectare. Wells should be considered as targets at risk. The number of wells and the presence of any springs should be noted. The minimum distances of wells/springs from wastewater treatment systems and percolation areas/polishing filters are set out in the GWPR for wastewater treatment systems for single houses. Wastewater treatment systems do not pose a risk to decommissioned wells if they have been properly sealed off in accordance with BS5930 or other guidance document. In general, groundwater flow direction can be inferred from topography on sloping sites and/or proximity to surface water features such as rivers or lakes. It should be indicated on the site plan. The presence of vulnerable features such as outcrops, swallow holes etc., should be determined and the distance between them and the proposed development noted. A high density of streams or ditches tends to indicate a high water table and potential risk to surface water. Low density of streams indicates a free draining subsoil and or/bedrock. Current and previous land use should be noted in particular any previous development on the site should be highlighted such as old building foundations etc. Density of housing should also be noted. Rushes, yellow flags (irises) and alders indicate poor percolation characteristics or high water table levels. Grasses, trees and ferns may indicate suitable percolation characteristics. The ground conditions during the on-site investigation should be noted. Trampling damage by livestock can indicate impeded drainage or intermittent high water tables, especially where accompanied by widespread ponding in hoof prints. It is critical that all potential targets are identified at this stage. The minimum separation distances that should be used in the visual assessment are set out in the Epa Wastewater Treatment Guidelines; these apply to all on-site wastewater treatment systems. If any of these requirements cannot be met, on-site wastewater systems cannot be developed on the site. The recommended minimum distances from wells and springs should satisfy the requirements of the groundwater protection response, which should have been reviewed during the desk study and confirmed during the on-site assessment. All the information obtained during the visual assessment should be used to site the trial hole and percolation test holes. The soil and subsoil characteristics. The trial hole will help to predict the wastewater flow through the subsoil. It should be as small as practicable, e.g. 1.0 metre x 2.00 metre in plan, and should be excavated to a depth of at least 1.2 m below the invert of the lowest percolation trench. The health and safety aspects of placing a trial hole on the site should be borne in mind. A trial hole is a deep, steep-sided excavation, which may contain water and which may be difficult to exit from if improperly constructed. A risk of collapse of the side-walls of the trial hole may exist in some situations. All appropriate health and safety precautions should be taken. A percolation (permeability) test assesses the hydraulic assimilation capacity of the subsoil i.e. the length of time for the water level in the percolation hole to drop by a specified amount. The objective of the percolation test is to determine the ability of the subsoil to hydraulically transmit the treated effluent from the treatment system, through the subsoil to groundwater. The test also gives an indication of the likely residence time of the treated effluent in the upper subsoil layers and therefore it provides an indication of the ability of the subsoil to treat the residual pollutants contained in the treated effluent. There are two basic types of percolation test: the T-test and the P-test. The result of the percolation test is expressed as either the “T” value or the “P” value. A minimum of two test holes should be excavated and tested at each site. The T-test is used to test the suitability of the subsoil, beneath the invert of the proposed percolation pipe or polishing filter distribution system to hydraulically transmit the treated effluent from the treatment system. The precise depth at which the percolation pipe will be located (and, by consequence, the top of the T-Test percolation test hole) will depend on the most suitable subsoil layer for treatment and disposal and the depth of topsoil at the site but will normally be at least 450mm below the ground level, to provide adequate protection for the percolation pipe work and to ensure that the percolation pipe is discharging into the subsoil layer. The assessor will decide the actual depth at which the percolation pipe will be located, based on the results of the visual assessment and the trial hole investigation. This in turn will dictate the depth from ground surface to the top of the T-test percolation hole. 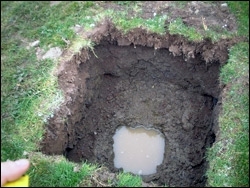 A T-test should be conducted at all sites because if a T-test is in excess of 90 then irrespective of the P-test result the site is unsuitable for discharge of treated effluent to ground as it will ultimately result in ponding due to the impervious nature of the underlying subsoil (or bedrock). 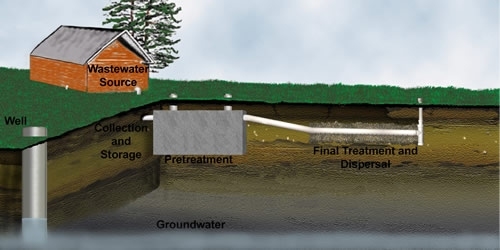 Where the visual assessment and trial hole investigation indicate limiting factors for installation of a conventional septic tank such as a high water table or shallow bedrock, and an alternative treatment system that would discharge to ground through a polishing filter is being considered. Percolation test holes should be located adjacent to; but not within, the proposed percolation area. It is important to note that the top of the percolation hole should be located as accurately as possible to the same level of the invert of the percolation pipe. Further, attention should be given to the impact of slope and subsoil layering on the location of the invert of the percolation pipe. Where unsaturated subsoil depth is limiting, it may be possible to choose a percolation pipe invert level, which is near or at the ground surface, in order to fully exploit the available subsoil depth. In such cases it will be necessary to provide protection for the percolation pipe-work, when installed, by placing soil over the pipe-work in sufficient quantities (minimum of 150mm gravel and 300mm topsoil) to ensure that damage due to activities on the surface does not occur. 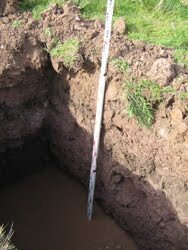 In the case where there is a high water table present then it is critical to assess the subsoil layer just above the water table by carrying out a percolation test, thus determining whether or not the water table is due to a low permeability subsoil or a naturally high water table due to the site’s hydrological location. In situations, where the T-test is in excess of 90 then irrespective of the P-test result the site is unsuitable for discharge of treated effluent to ground as it is likely ultimately to result in ponding due to the impervious nature of the underlying subsoil (or bedrock). Where experience indicates that the site may be borderline, then both tests should be carried out at the same time. The subsoil classifications from the trial hole should be confirmed by the percolation test results. If there is not a good correlation then further examination should be undertaken to determine which assessment provides the accurate assessment of the suitability of the site to treat and dispose of the effluent. An integrated approach is required when carrying out the assessment. Retention time in the subsoil insufficient to provide satisfactory treatment. Site is unsuitable for conventional wastewater treatment system. P-test should be undertaken to determine whether the site is suitable for a Secondary Treatment System with a polishing filter at ground surface or over ground. Sites may be suitable for discharge to surface water in accordance with Water Pollution Act licence. Site is suitable for the development of a conventional septic tank system or a Secondary Treatment System discharging to groundwater. Wastewater from a conventional septic tank system is likely to cause ponding at the surface of the percolation area. Not suitable for a conventional septic tank system. May be suitable for a secondary treatment system with a polishing filter at the depth of the T-Test hole. Wastewater from a conventional septic tank system is likely to cause ponding at the surface of the percolation area. Not suitable for a conventional septic tank system. Site unsuitable for polishing filter at the depth of the T-Test hole. P-Test should be undertaken to determine whether the site is suitable for a Secondary Treatment System with polishing filter, i.e., 1≤ P ≤ 75, at ground surface or over ground. Site is unsuitable for development of any wastewater treatment system discharging to ground. Site may be suitable for treatment system discharging to surface water in accordance with Water Pollution Act licence. Retention time in the subsoil insufficient to provide satisfactory treatment. Site is unsuitable for any treatment system without carrying out significant site improvement works. Site is unsuitable for development of a wastewater treatment system discharging to ground. Site is unsuitable for development of a wastewater treatment system discharging to ground. Site may be suitable for a discharge to surface water in accordance with Water Pollution Act licence. The information collected from the Desk Study and On-Site Assessment should be used in an integrated way to determine whether an on-site system can be employed as a favourable effluent treatment and disposal option. If so, the type of system that is appropriate and the optimal final disposal route for the treated wastewater is determined at this stage. Depending on the characteristics of the site, more than one option may be available. Currently Irish legislation requires that a wastewater treatment system to be used for the treatment of effluent from a single house be certified by the Irish Agrement Board or other specified certification system. In order to ensure compliance to water quality, planning and building regulations, an appropriate certification body should certify such systems. A single house treatment system will entail capital, running and maintenance costs. In choosing a system due regard should be given to the overall relative costs. Availability of appropriately qualified technicians. Ease of access to the system in order to perform maintenance e.g. de-sludging. Anticipated Life-time of the system. Track record of the system.